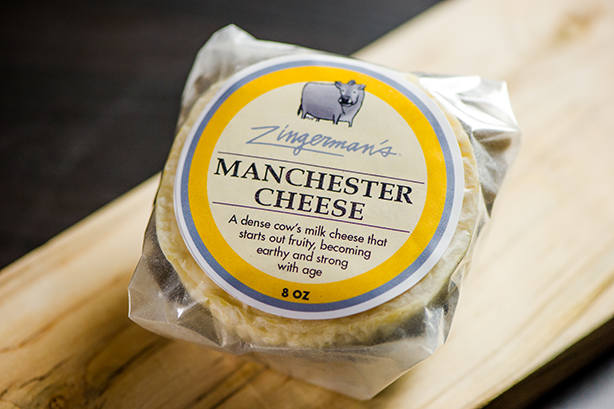 How Our Award-Winning Manchester from Zingerman’s Creamery Got So Good! 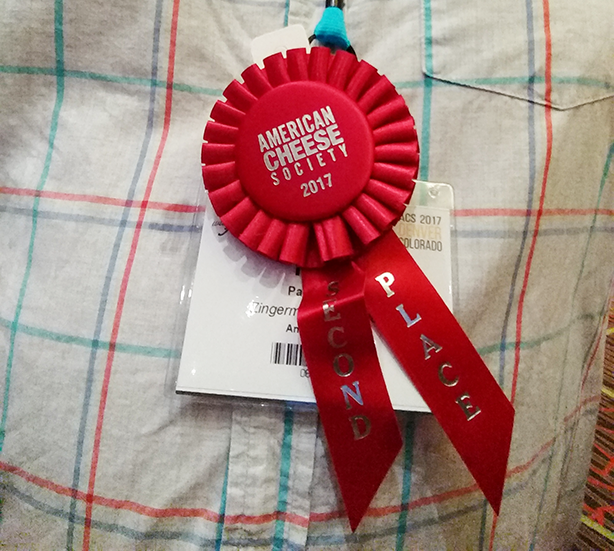 Zingerman’s Creamery just won big at the 2017 American Cheese Society Judging & Competition. 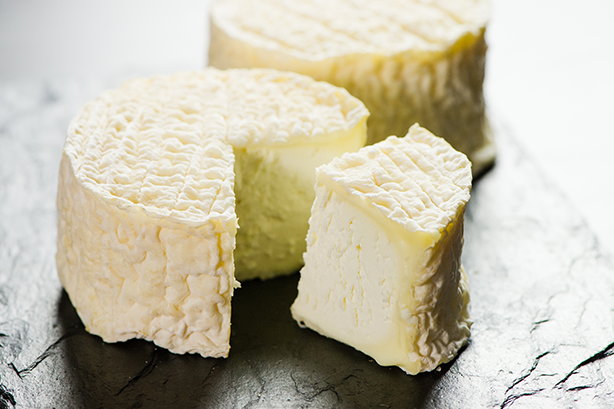 Our Manchester was honored with a second place award in the Soft-Ripened Cheese category. Creamery managing partner Aubrey Thomason tells us how this cheese got so good! 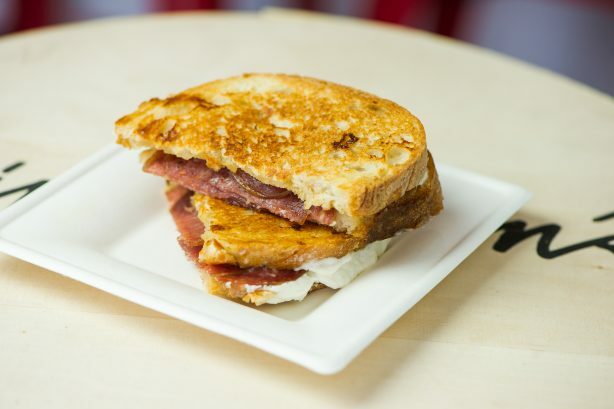 When I started at Zingerman’s Delicatessen in 2002, the Creamery had just opened on a farm in Manchester, MI. I began at the Deli running trays and bussing tables—where all the truly great start. I started selling cheese behind the counter in 2005. At that time, the Creamery was endeavoring to make most of the cheeses we still make today. In its early days, the Manchester was rustic. Like many cheeses of its type seen in French farmers markets, it was often dry and covered in all kinds of rogue molds: black, yellow and brown. Five years later, after forays into the world of agriculture and cheese, and much travel abroad, I convinced John Loomis, founder of Zingerman’s Creamery, to give me an internship. I worked through the production week, working without pay the sixth day of every work week. I was very interested in farming and cheesemaking, but I wanted to see what actual agricultural production was like. After three months of cheesemaking at the Creamery, I embarked on a Zingerman’s-sponsored road trip touring dairies, breweries, and farms all over California. After that, I lived in a trailer on my sister’s property in Oceana County and worked on a vegetable farm for the summer, learning the life of a producer. When I came back I was definitely interested in the life. Early in the fall, a production assistant position opened at the Creamery and there I went! I cut my teeth learning to make the Manchester. Cheesemaking is similar to farming: each “make” is a microcosm of an experiment that only plays out over time. When I came to the Creamery, the Manchester was being made from Calder Dairy cow’s milk, our long time supplier out of Carleton, MI. We were adding cream from Guernsey Farms Dairy. The milk was acidified with MM100 (the citric acid of starter cultures), which has an uncontrolled acid profile. Just as an example, the recipe called for adding 25ml of dry powder to the milk. I reduced it by 5mls a week until I was down to 1ml of starter and I still got the same result: too much acid. The Manchester was formed by ladling four layers of cream-enriched cow’s milk into molds. This in itself is not bad; it’s actually an excellent way to create texture, however it makes for much wetter cheese that is difficult to drain perfectly. Drainage is critical to consistency. It took many years to accept that adding cream to ripened cow’s milk cheeses was never going to work. It always had the potential to ferment differently than the rest of the milk, and would produce fermented banana flavors and bitterness. Eventually, we removed all of the cream from all of the mold-ripened cheese recipes. The Manchesters were drained in forms and then brined (soaked in a salt water solution, where the salt is absorbed through osmosis). This is commonly used for cheeses which are made with much more rennet and have a very elastic curd. 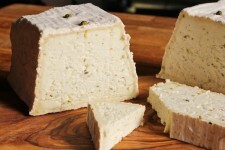 Dry salting is used almost exclusively in the salting of mold ripened soft cheese, like the Manchester. By brining, we were literally adding more moisture to a cheese that we needed to remove as much moisture from as quickly as possible. And it essentially created an uncontrollable and unstable surface environment. The cheese rarely and without notice turned out well. At first I thought that everything was about the aging environment, how much moisture you held them in, how often you turned them. Then I turned to the cleanliness—everything had to be washed before use—the production facility, the aging rooms, and it goes on and on. I now keep a running document for training that consists of 17 factors that contribute to cheese bluing (or growing rogue molds); I continue to encounter new problems, and continue to add to it. The Manchester’s success meant the success of the Creamery for me. Because of the technical precision required to make it great, I knew that once the Manchester had achieved some status that the Creamery was on its way. Beginning in 2007 I changed the recipe once a week for six years—that’s more than 300 changes to the process. The recipe for a cheese is all about process. The science is about understanding cause and effect, controlling variables and hitting targets for acidification, drainage, salting, and ripening every time. Every change I made to the Manchester taught me more and more, and all of the cheeses started to get better. In 2011 I went to England and trained under French Cheese consultant Ivan L’archer. Working with him really directed the course of my cheesemaking. I kept reading, kept teaching myself chemistry, I kept changing something in the recipe every week. And I really started to understand what I was doing. In 2013 I went to the Vermont Institute of Artisan Cheese and studied with Ivan for again for another ten days. It was the first time that I understood everything he said. Over time, I learned that everything is about acidity. I learned how to grow my own starter culture, how to dose the milk so it arrived at the perfect acidity every time (most of the time anyway). We practice “lactic” cheese making – making fairly acidic cheeses. When we acidify we are trying to arrive perfectly on time at our desired acidity. No more, no less. If you miss the desired acidity level by even one degree, the cheese will be different (dry, pebbly, ripens fast, a rainbow of molds and yeasts in blue, green, yellow, pink—you name it, I’ve seen it). 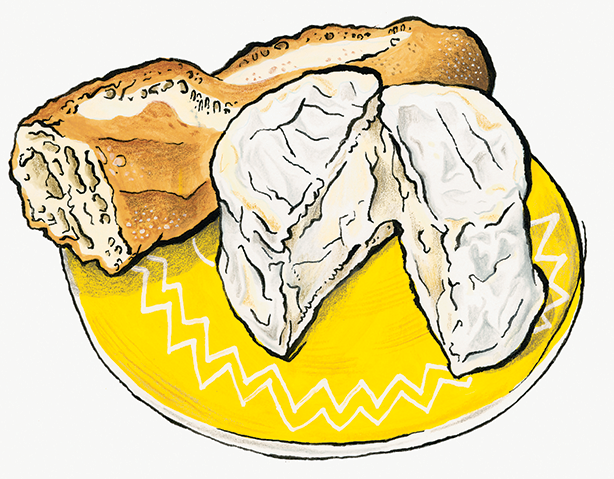 Fermenting milk for lactic cheeses is much like fermenting dough for sourdough. You want a long, slow acidification at cooler temperatures so the the bacteria have time to do their work. It gives you a big rich, fully sour flavor, not just a short, sharp sourness. The only thing we change for every make is the level of starter culture. We “read” the milk, and move in the direction it is telling us. The milk needs to arrive at that specific acidity according to schedule. Sometimes it is fast and we are chasing it to get the curds draining; sometimes we wait an extra 8-12 hours for it to be ready; sometimes it is right on time. This is the weekly dance that makes us artisans. We go where the milk goes. All milk is not created equal. You want milk from a healthy sized herd for the land they are on, with good quality forage, and dry feed grown locally without chemicals. And then you want that milk as fresh as you can get it, transported as short a distance as possible, and you want to transform it as quickly as you can. We pasteurize at the lowest temperature we can, hopefully preserving some of the beauty of the milk and the work the farmer has done to raise it. Milk is an excellent medium for transmitting flora that is good for us and tastes delicious. We are taking lactic acid starter cultures, secondary ripening cultures, yeasts and molds, and we are drawing out the flavor in the milk, reproducing or encouraging the existing bacteria to live. We use the milk as a canvas, increasing the good bacteria already present in the milk, and killing anything untoward with pasteurization and acidification. What I learned over time was that if you got the chemistry of the cheese right (meaning the right acidity in the right amount of time), if you drained the curds enough, if you added the right amount of salt in the right way, even without the proper facilities—the cheese could turn out great. However, not having the proper facilities meant this only happened at certain times of the year. In July of 2016, we closed down our facility for a nine month construction project. During the closure we made cheese at the Dairy School at Michigan State University. The Dairy School uses milk from an onsite herd. We could not get milk from any of our sources up to Michigan State without great cost. It was a risk, but we stopped using the Jersey milk and switched to the MSU milk, with no added cream. The cheeses turned out great. Considering that we were transporting them back from MSU and operating out of a temporary facility, it was actually shocking. The cheeses just kept getting better. The greatest success in business ownership is when your team can make the product better without you. We closed our business, went under construction, and I was gone for 6 weeks after giving birth to my twins. When we moved back into our renovated facility in April we made the decision to make the Manchester out of Calder Dairy’s milk again. It is truly excellent milk—it’s delivered very fresh, the animals are healthy and it’s the right size farm. This year, as usual, we entered several of our cheeses into the American Cheese Society Competition—an annual competition where thousands of cheeses are submitted for judging. This year, only 411 won awards. Honestly, we have had a few bumps in the road since we moved into our new facility, and although the cheese is still tasting great, I was not expecting to win anything. What is truly remarkable and inspiring about winning second best in our category—we tied with Moses Sleeper, Jasper Hill, VT (come taste it in our shop!) who not only produce what I consider to be one of the best cheeses in the soft ripened cow’s milk category, but are one of the best cheesemakers in the country—is that we haven’t even hit our stride. We are great cheesemakers with a great facility to match. We can now do the milk justice, as shown by the Manchester entering its category with the competition. We will never stop improving. We will continue to make all of the tiny changes in everything that we do to get to greatness. I want to appreciate my former partner John Loomis. He let a young kid who didn’t know anything mess around with his cheese. He trusted my intuition and let me run with it, and then entrusted the business to me. I promised that I would do him proud. Thank you to the team at the Creamery who has stuck by me and our dream through thick and thin. Their drive they have for greatness keeps me going when the days get tough. Thank you to the customers near and far who have provided valuable feedback and stuck with us, loving all of the versions of the cheese over the years. Want to experience the Manchester? Come by the Cream Top Shop and ask for a taste! We also sell it at Zingermans.com, which ships all over the United States. Meet the Manchesters. They’re on Sale ALL MONTH! Cheese of the Month: Detroit Street Brick!